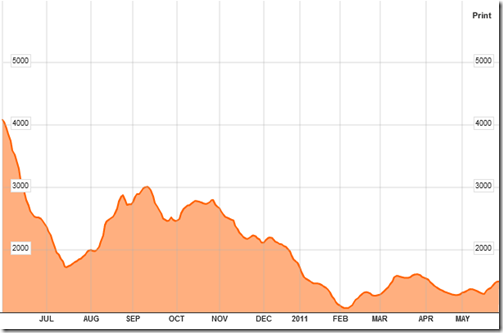 The Baltic Dry Index is a daily average of prices to ship raw materials. It represents the cost paid by an end customer to have a shipping company transport raw materials across seas on the Baltic Exchange, the global marketplace for brokering shipping contracts. However, if you want to place in context the fluff about the US (or World) economy floated by your “favorite” news agency or administration spokesman – just pull up the 5 year chart of the Baltic Dry Index. The aftermath of the Great Recession and consequent efforts to revive the US (and worldwide) economy is reflected in the period of mid-2009 to mid-2011. All that stimulus and confidence measures have largely achieved naught. 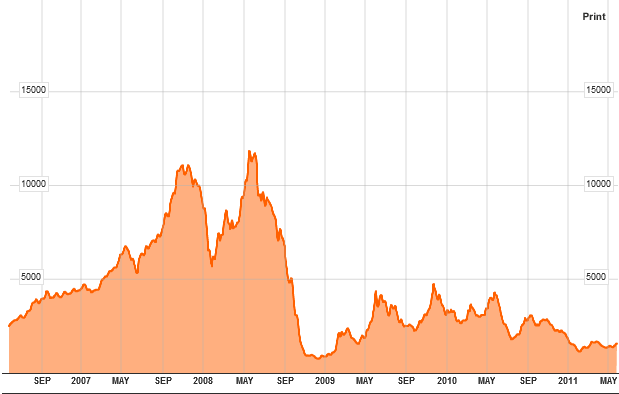 If the Baltic Dry Index meanders at the bottom of the chart above on a go forward basis – then there is a great likelihood that the Great Recession from 2009 will resume with all its consequent effects. Sorry folks – this is terrible news but forewarned is forearmed.